Looked OK, so the rest of the sections were finished off ..
with that done I've been sketching out some plans for ditch, covered way and glacis to go in front. I think I can fit in a something representational without losing too much table space. At the beginning of last year I posted some piccies of prints depicting the stages of a siege (see here). I had intended to sort out my fortress bits and siege fieldworks over the year - not achieved at all - although I had thought about it a couple of times. So in order to get on with it in the new year I got all my relevant scenic items out for a setup to see how things shaped up. The fortress walls and bastions can be arranged in two ways, the first arrangement provides a projection from the back or side of the table. the second arrangement sits in one corner of the table..
Not quite enough, but I have some spare materials to build some more and will need to add more gabions if possible. So plenty to keep me busy - my first project for the new year ! The court poet read his latest work.. The singing nuns from the priory of Waldemart sang works by Hildegard of Bingen..
Jives: How is you aunt ? Duke Lobster: I say Jives, do you have the scrolls ? With all the extra people expected at the palace this Xmas, additional servants have been hired and a new livery introduced. They arrived in one of the larger cellars; here Count Hermann had setup his 'operations' room; it was here he collated information from border patrols, spies and reports from ambassadors.. The Field Marshall joined them to dicuss the current status of the border wars in the south-west with Saxe-Jarlsberg and the state of the Monrovian army. After returning to the palace the King changed his clothes and joined his wife and some of the court for a spot of tiffin. Saxe-Jarlsberg's allies, Hesse-Limburger, now have their own artillery contigent - limber set from NZ molds, gun and crew from Irregular Miniatures. 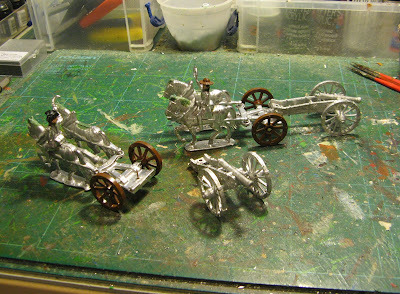 The artillery from Wittenbergs' Zinzendorf provice have received a new limber set from NZ molds. I've replaced the guns for the Wittenberg artillery with some from Sash & Sabre but used some Irregular Miniatures gun barrels instead - existing NZ limbers sets have been repainted - all in the gun colours used by the Duchy of Saxony (crew unchanged - these were cast from Creartec molds). I'm having a sort out with my artillery for 40mm; initially I've cast two limber sets up from NZ molds and bought two new guns from the Sash & Sabre SYW range. I find the NZ mold wheels difficult to cast so I've used some small Lego plastic spoked wheels instead. I've swapped the NZ limber horse rider heads with some from Sash & Sabre. The two new guns and one limber set will go to the Wittenberg forces; the other limber set plus one of my spare guns and some crew which are on order, will be for Hesse-Limburger allied artillery contingent to Saxe-Jarlsberg. Happy with the new hedging concept (see previous post) - I spent a couple of sessions making up all the hedging I could, had to buy some extra foliage clumps as I ran out, last thing to do was to have a couple of sections with gates. I made up the gates with some model railroad lineside fencing and plastic strip; then the gates were stuck on and painted. All the hedging sections done and laid out on the gaming table, enough for now ! My first trial sections of new hedging, with different size figs (1/72 WWII, 28mm, 40mm), the wood is just painted a sort of grass green colour and the foliage clumps stuck on top. A more ground level shot, hedges are a bit low for the 40mm in places - but OK for gaming. So now I'll get into full production, will have about 25 6inch lengths when I'm finished. The Irregulars were lowsy shots most of the way through the game, except towards the end when they started knocking off a few brigands - obviously their aim improved over time when under fire ! The Irregulars did take casulaties however none were killed; 4 with light wounds and two badly wounded. One feldjager was wounded and one jager was killed; On the brigands side they lost 10men (out of ~30).